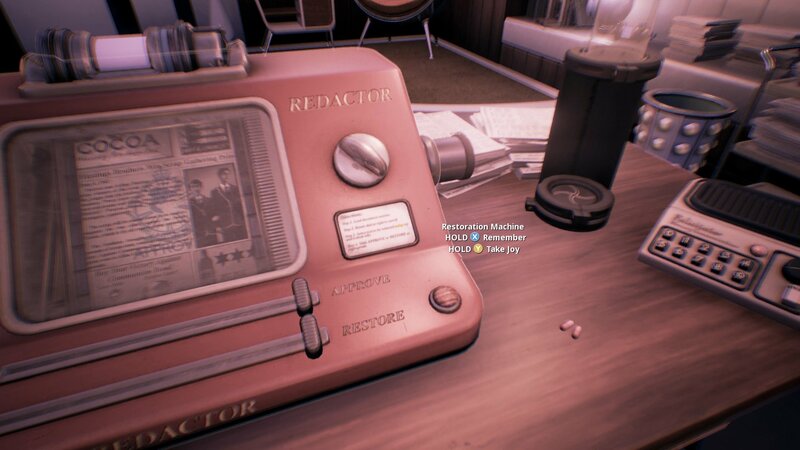 One thing We Happy Few players want to know is what happens if you take Joy at the beginning of the game. While the decision may not seem all that important, making the “wrong” choice can result in the game coming to an end and you having to restart all over again. To help make things easier, we put together a quick guide on whether or not you should take Joy at the beginning of We Happy Few. Find out whether or not you should take Joy at the beginning of We Happy Few. During the prologue of We Happy Few, bad memories begin to flood Arthur’s mind. These seem like they’re almost too much for Arthur to handle, leading to first key decision you’ll make in We Happy Few. When presented with a pink Joy pill, you’ll either need to choose to take it or to go without it and fully remember past events. Most players will opt not to take the Joy to get more backstory on Arthur. By choosing not to take Joy, Arthur will remember and the game will continue. However, if you choose to take Joy at the beginning of We Happy Few, the game will abruptly end and the credits will roll. Naturally, you’ll need to go back to the beginning and start over again, choosing not to take Joy. Of course, by choosing to take Joy in the beginning of We Happy Few you’ll unlock the achievement “Snug as a Bug on a Drug.” If you’re looking to unlock all achievements in We Happy Few, there’s no harm in taking Joy at the beginning of the game, then restarting and refusing Joy the second time around. As you progress through the game, you’ll face more critical decisions later on, so don’t sweat the choice to not take, or take, Joy at the beginning of We Happy Few. What decision did you make? Did you decide to take Joy and unlock the achievement “Snug as a Bug on a Drug,” or did you decide to skip and not take Joy? Let us know down in the comments below! By reading through this guide, you should now know whether or not you should take Joy at the beginning of We Happy Few.